Our handwoven textiles are so rich that we can proudly wear it for any occasion. Though many mill printed and cheap options are readily available everywhere, but nothing beats the contentment of wearing something done with hands. 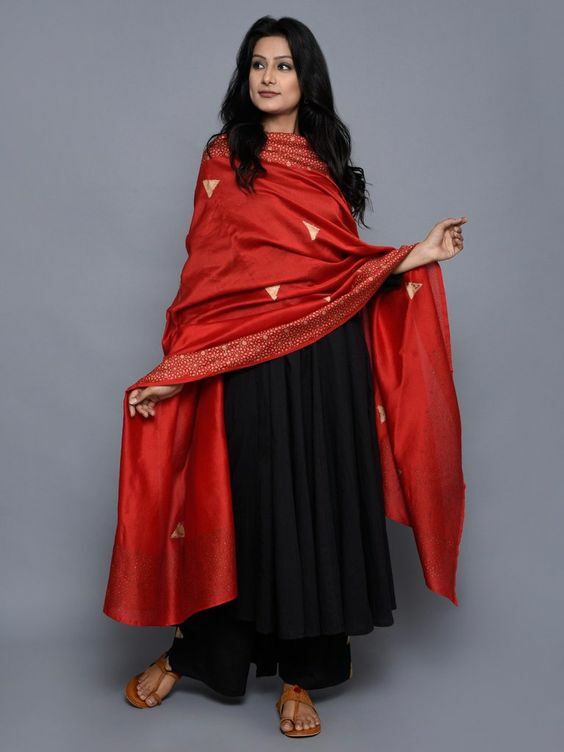 Here are few popular handwoven dupatta’s which every women should have in their wardrobe. They are easy to match and look great with plain kurta’s. Chanderi Dupatta– Chanderi is a rich hand woven fabric which is chic and timeless and we all are well introduced to this fabric. It can be best paired with all natural fabrics like kurta’s in cotton, linen, silk etc and other natural blends. 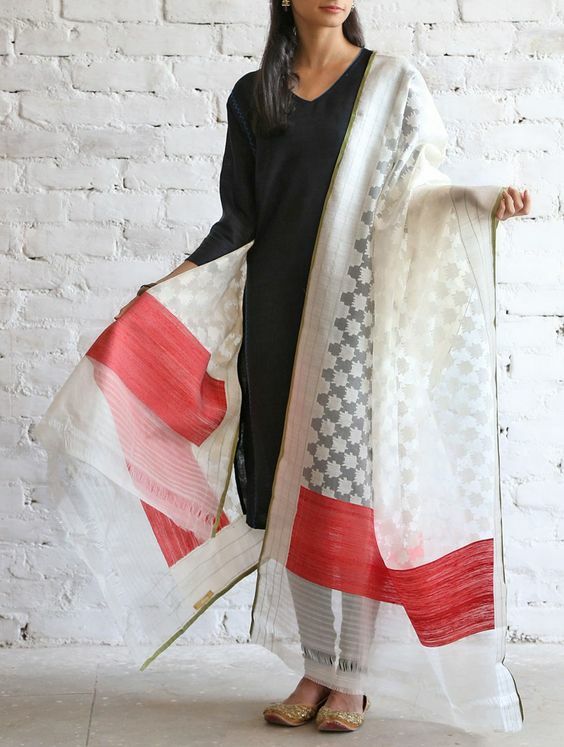 Block prints on Chanderi dupatta‘s look equally enchanting. So next time you plan to wear a plain kurta, you can delightfully throw a chanderi dupatta around. 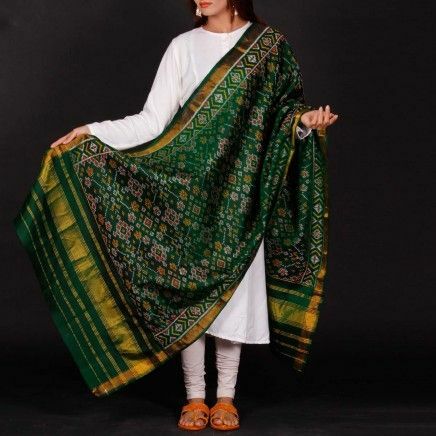 Jamdani Dupatta– One of the finest muslin textiles of Bengal, Jamdani is woven using fine quality cotton. It is so delicate that you can almost see through it. The patterns are done in self on self style or in a contrast color like this one. You can pick designs from intricate to bold one’s, and it will instantly add a style to your kurta. Banarsi Dupatta-Nothing can be more perfect than wearing a gorgeous Banarsi dupatta for a party. 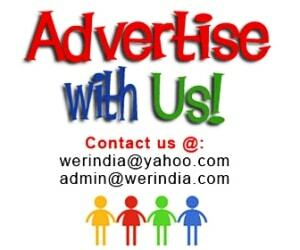 You can team it up with plain kurta’s or the one in self designs. Their vibrant colors and shiny texture makes sure that you stand out in your attire. Patola– Usually done on silk, Patola is very similar to Ikat and is made in Patan, Gujarat. Great for a party wear. Kota doria– Another famous weaving style from kota, Rajasthan. The fabric basically has square holes and is done in silk or cotton. It is a little transparent and therefore makes a fabulous dupatta material. Many a times the fabric is block printed to make it look more beautiful.